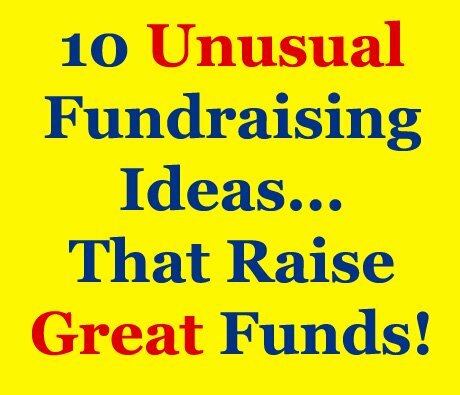 Here are 10 creative and unusual fundraising ideas to get the creative juices flowing, and that are sure fire ways of having fun and raising great funds. Remember to think carefully when choosing which fundraisers to use though. Consider your funding needs, your fundraising committee/team size, resources, and who your supporters are (or will likely be). Some fundraisers are perfect for certain groups, but won't work for others. So think carefully about what will work for you. Choosing the right fundraisers is the first of four steps to a successful fundraiser! Before you use any of these ideas though, please remember to make sure that you have your fundraising basics in place. For Charities: Make sure you have a solid donor program setup, that has an effective retention rate. Read about it on the Charity Fundraising Ideas page. And for Individuals & Once-Off Fundraisers: Ensure that people have a simple way of making a donation to your cause, and finding out more about it. An online donation page (Crowdfunding) is usually the best for this. You can setup your donation page for FREE here. Garden owners pay a fee for the removal of a decoration invasion that you snuck in during the night. These could be Plastic Flocking Flamingos, Garden Gnomes, or Pink Toilets. Increase earnings by allowing people to buy insurance against having an invasion, and/or an extra fee to have the invasion go to a specific person's garden after leaving theirs! This idea can be really lucrative, but you'll need some tour volunteers, a solid promotion plan, and willing Owners of gardens or homes that are absolutely spectacular. Then charge a fee to take tours through those properties. This type of Auction is perfect for Schools or organizations with Youth Groups. Simply auction off services on specific dates/times that your teenagers can perform. For example, lawn mowing, house cleaning, car washing, etc. A unique fundraising idea that is not used by many causes but can be very lucrative. 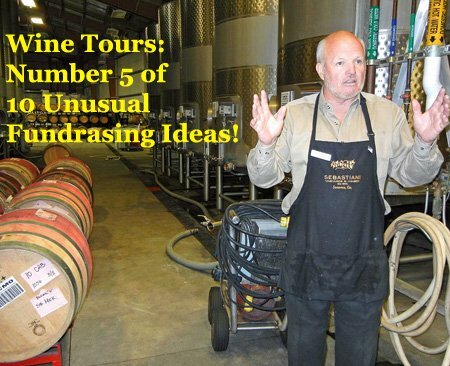 Similar to the Garden Tour, offer a tour service to local wine vineyards. A mixture of a Silent Auction and Raffle, this is a real winner! Bidders buy numbered bid tickets that they place in raffle buckets next to the items they want. Each item then has a raffle draw at the end of the auction to see which ticket/bidder wins the item. The more they want the item, the more bid tickets they can place in the raffle bowl, and the more chance they have of winning. And the more you'll raise!!! 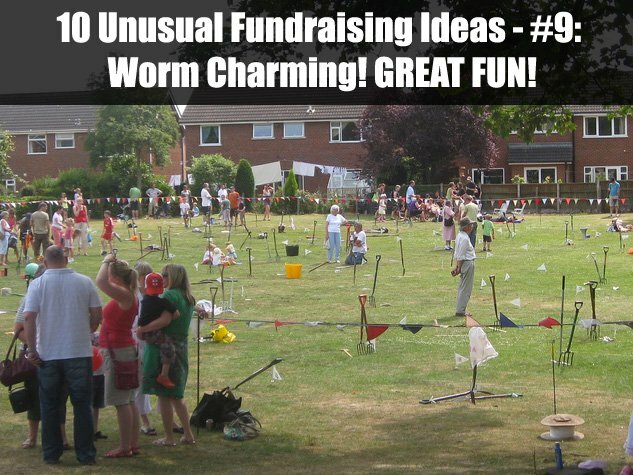 This is definitely one of the best of these Unusual Fundraising Ideas! Have a volunteer (or a few) jailed in public view, and set a bail amount for donors, supporters and passersby to raise for them to be released! Charge a fee for lengths of duck tape that particpants can use to stick a high profile volunteer (like the principal of your School), to the wall. This fundraiser is an absolute hit at schools! Hold a penny drive and full an empty 5l bottle (or multiple) with coins. Then with a great prize on offer, charge people a fee to guess how many coins are in the bottle! This is such a weird and unusual fundraising idea. But it's also loads of fun. Divide a field into blocks for teams and participants. They then have to charm as many worms as they can to the surface with a Garden Fork. Most worms wins the compo, and you raise funds through entrant fees, raffles, and other sales. Find out how it works here. This, the last of the unusual fundraising ideas, is a unique fundraiser that you can get very creative with. Supporters, guests, students, etc. vote to decide something with donations. The item/choice with most donations wins the vote. It could be a vote to decide which volunteer has to do an undesirable action, like swim a river in winter. Or a vote on what torture the volunteer will receive, like a pie in the face, spaghetti swim, or the 7th idea here - Wall Stuck! This is essentially a T-Shirt Fundraiser but which is run in the same manner as a Crowdfunding Campaign - which is very unusual. BUT it's a brilliant idea still! It's done through a specialized Crowdfunding Platform which you sign up for FREE with. You then create a t-shirt design, set a fundraising goal, and promote and sell off your dedicated T-Shirt Crowdfunding page. The platform then handles all orders, payments, and conveniently the printing and shipping of shirts (Worldwide). It's essentially RISK-FREE fundraising. To find out more or to start your T-Shirt Crowdfunding campaign, go here. You don't need to handle taking orders, shipping, or accounts. Plus the products are super popular!!! Definitely worth checking out and setting up. So choose the right fundraisers for you cause, and then plan, organize, promote and execute the fundraiser as best you can! And definitely check out the creative ideas articles below for more unusual ideas you could look into.